Masvingo Propol Gala soccer finals between Masvingo Central District and ZRP Masvingo Provincial Headquarters (PHQ) ended with 5-4 goals in favour of the former in penalty shoot-outs after the 90 minutes had ended with a 1-1 draw in a match played at Zimuto Camp last Friday. All eyes were glued on Constable Frank Mageze of ZRP Chikato who was later crowned man of the tournament while his team mates, Sergeant Owen Tatsaukana became the top goal scorer of the tournament. ZRP Masvingo Central District is going to represent the province in most of the disciplines after it walked home with a collection of trophies. In most of the games the district took trophies in both men and women soccer categories, volleyball and most of the pool categories while its biggest rival, PHQ dominated in darts. In women soccer, constable Confidence Mupeti of Mwenezi was the star attraction who was later crowned lady of the tournament after shrugging off competition from Constable Penelope Mugari of Masvingo Rural. 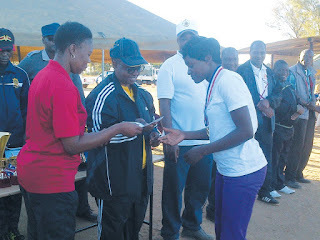 Many people were so impressed by Constable Mupeti's skills that they said she could still have won the titles in the male categories as well if the categories were to be combined. Various participants walked away with gold, bronze and silver medals in different disciplines like weight lifting and athletics.